Bat flowers belongs in the genus Tacca, a small group of 15-20 tropical perennials. They have been re-classified as a member of the yam family (Dioscoreaceae). Australia has two native species, Tacca leontopetaloides and T. maculata. I’ve seen the former species fruiting on coastal hillsides between Cairns and Mossman, but the most commonly cultivated species in Australia is the Black Bat Flower (Tacca chantrieri). I grow the Giant Bat Flower, Tacca integrifolia, from the tropical lowland rainforests of Bhutan, Bangladesh, India, Pakistan, SE Asia, Indonesia and Malaysia. The Black Bat flower comes from China. Their flowers have the longest ‘whiskers’, more correctly known as filamentous bracteoles, and they spread and curve downwards from the flowers. The Black Bat Flower is a recently evolved member of this genus. In a review of the reproductive biology of the genus Tacca by the Institute of Botany at the Chinese Academy of Sciences (2011), scientists agree the filamentous bracteoles are a modern evolutionary development. Since they take energy and resources to develop, they probably support reproductive success in the wild. Beyond that are various competing hypotheses, all unsatisfactory to a degree. One is that the bracteoles are sacrificial. Grazing animals – possibly caterpillars – get their feed by eating them, and they are fully fed before they reach the developing seed. Another is that they encourage ants, providing a quick route to help them gather and disperse mature seed. But research has revealed one evolutionary conundrum – as the genus has evolved modern species with longer bracteoles, the less these species rely on pollinators. The Black Bat plant is one of the most recently evolved and its flowers offer pollinators little pollen or nectar as a reward for their pollination services. Black Bat plants are fully capable of producing viable seed in the absence of pollinators in the wild. Bat flowers like a well lit, sheltered position – such as near a fence and under the dappled shade of a jacaranda in a spot facing east. Bat flowers prefer growing in equal parts of garden soil, compost and premium potting mix. Water regularly during dry or windy conditions except during winter, when they need little water. Give them good drainage – they grow best in plastic pots. Never stand pots in saucers filled with water, otherwise roots will rot. Feed with seaweed solution in summer and autumn and repot in October. 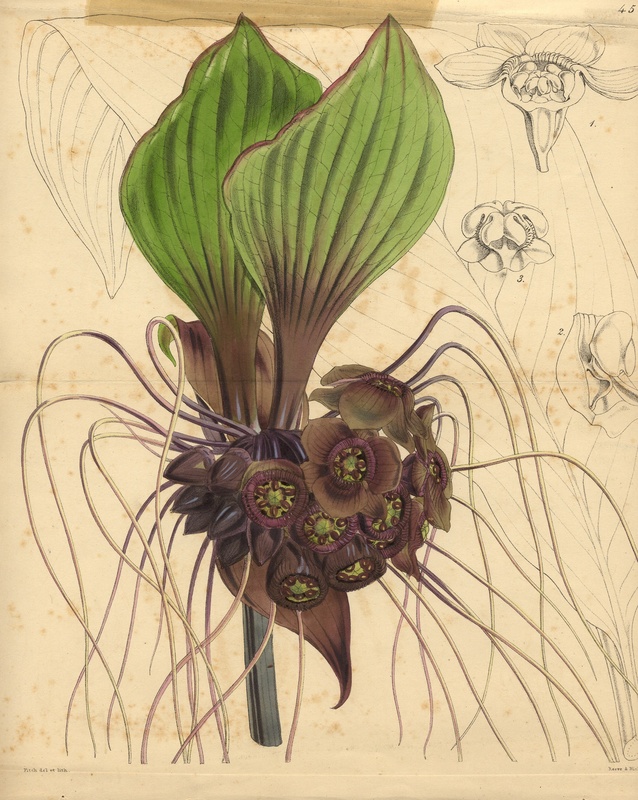 The illustration is Tacca cristata from Curtis’ Botanical Magazine.